The design goal for Terminal 2 was to bring back the joy and romance of travel within a hospitable environment. The inspiration for the architecture was “a bridge to the city,” evoking San Francisco’s micro climates, use of natural light, the diversity of Bay Area neighborhoods and the concept of the ceiling as a “sky” holding everything together. These architectural design concepts became the inspiration for the artwork as well. The local skies, as they are populated by native birds, was the inspiration for Walter Kitundu’s interactive artwork designed for one of the two children’s play areas adjacent to the gate rooms. Walter Kitundu is a sound artist, installation artist, and inventor of original musical instruments that navigate the boundary between live and recorded performance. He is also a consummate woodworker, and an avid bird watcher and photographer. For this work, his interests were combined to create a group of hand built, interactive, musical artworks that are designed to offer travelers of all ages a playful oasis. The artwork consists of three parts: two “bird song” benches and a 27’ long musical mural. The benches are shaped like bird wings; the “feathers” can be played like a xylophone with an attached wooden mallet. Behind the benches is a wooden mural made of inlaid wood featuring local birds such as Red-tailed Hawks, Anna’s Hummingbirds, herons, egrets. Northern Harriers and Burrowing Owls. The images are from the artist’s own photographs which were scanned and then printed with permanent inks onto the wood and then inlaid into the mural. Behind the birds is an abstracted view of the City rendered in wood stains. The wings of the large central bird are also a musical instrument which can be played with an attached mallet. 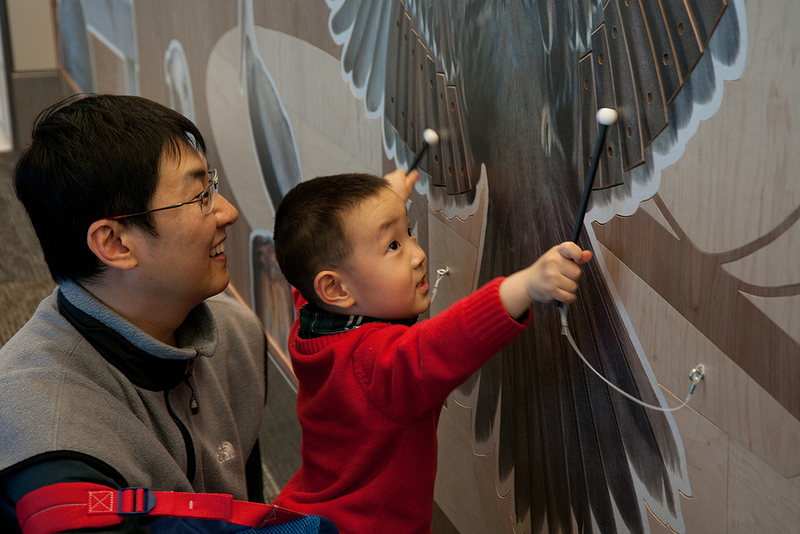 Each of the musical components of this installation are linked to a specific bird. When played left to right, a portion of the bird’s song is heard, in a lower register. The instruments can also be played freely, and they are tuned so that they can be played together harmoniously. It should be noted that there are no electronics associated with this installation; the sound is created and tuned by the size/ design of the PVC resonators behind the feather-keys.These artworks are exquisitely crafted, meet the needs of their intended site, and combine two art forms (visual art and music) into a single work enjoyed by all ages. "Two Public Art Projects Named America’s Best Public Artworks in USA"
"This very much hand-made offering by an earthy, no-nonsense builder and musician is such a solid and dignified corner in the terminal, it made the familiar airport current of stress and alienation stand still."